Once acclimatized to a new life in this new country, she enrolled in cosmetology school, studied business, and then opened her own Mak Salon in Alexandria VA, while raising a family—and finally turning her attention to art. 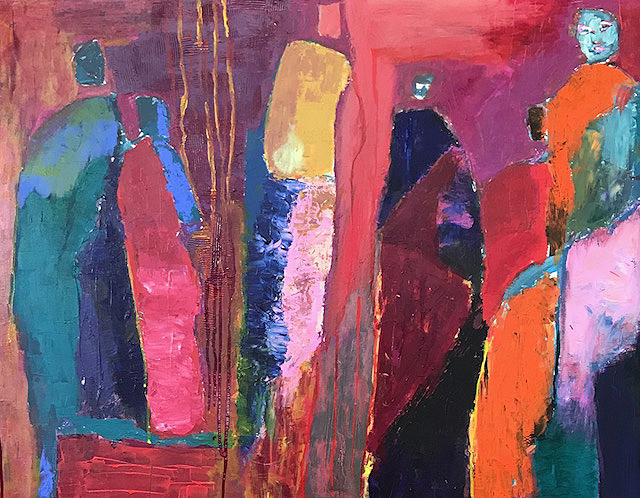 During the 1990’s Makda began taking classes at the Art League, finding her niche in Deanna Schwartzberg's painting class. Having been influenced by painters Jackson Pollock and especially Jean-Michel Basquiat, she dedicated one room in her salon to painting. In addition to Ethiopian and English, she has become fluent in the language of paint, producing emotional works that speak a universal language. Makda’s first Touchstone solo exhibition, She Runs Wild, reflects the total surrender of herself to painting, to speaking the truth in color, line and form. The gap between cultures she has experienced in her life comes into play as she works. “Like me in one culture and then moving into a new culture, I have to find ways to fit in—to make sense of it all.” That concept seems akin to what Jean-Michel Basquiat felt when he remarked, “I don't think about art when I'm working. I try to think about life,” Makda does too. She paints the gaps, sews up the wounds, and adds stories she hears to her own very big story. “We can connect with everyone we meet by listening, by being open to each, and finally by recognizing we all are one in the body of humankind. Painting relieves the burden of so many profound stories and it can be shared with viewers so they can relate to each image. Maybe to be healed too,” she reflects. Show Dates - March 2-March 25, 2018. Opening Reception: Friday, March 2, 6-8:30 pm; Meet the Artist/Artist Talk Sunday March 25, 1-3 pm.